Flatulence is the medical term for the occurrence of excess gas in the intestines and digestive track. The symptoms of flatulence include bloating, cramping, abdominal pain and the act of passing gas. Although no one wants to "have gas" the process is a common aspect of food digestion and occurs moderately in every individual up to twenty times per day. However, if you suffer from severe flatulence there are steps you can take to reduce its occurrence. The easiest way to reduce the symptoms of flatulence is to avoid the main causes of the condition. Consuming carbonated beverages (which contain excess air), chewing with your mouth open or eating too quickly (which causes you to ingest too much air), eating high fibre foods (like beans, cabbage, bananas and broccoli), chewing gum and not chewing your food well enough all contribute to the excess production of gas. Since flatulence is normal by-product of the digestive process you will not be able to avoid the symptoms entirely. When you are forced to deal with excess gas there are a few quick remedies you can use to decrease the severity of the symptoms. Sometimes relief from flatulence is as close as your kitchen. Items like lemons, sweet peppers, pumpkin, and yoghurt can be easily found at your local supermarket and used in a pinch to fight the occurrence of excess gas. The juice from a lemon, especially when mixed with water and ½ teaspoon baking soda, can quickly quiet down an overactive intestinal track and help eliminate bloating and cramping from excess gas. Sweet peppers or other vegetables that are high in vitamin C can be eaten to reduce the amount of gas produced in the intestines. However, vitamin C in tablet form can have the opposite effect and actually lead to the overproduction of gas. Pumpkin, whether baked, steamed or used as the main ingredient in soup or a side dish, has been shown to have soothing qualities that calm upset stomachs and reduce the occurrence of gas. Although dairy products are usually blamed for the onset of flatulence, yoghurt can actually help relieve the condition. Yoghurt, as long as it contains acidophilus, uses bacteria to keep the digestive process normal so that food doesn't sit too long in the intestines and produce excess gas. Another great place to find simple remedies for flatulence is in your spice rack or pantry. Herbs like peppermint, fennel, caraway and anise all contain flatulence-relieving properties. As do the spices like dill, basil, rosemary, turmeric, coriander, cardamom and cloves. 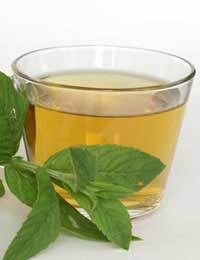 To get relief from excess gas using peppermint, simply pour one cup of boiling water over dried peppermint leaves and allow the mixture to seep for ten minutes. Drain the liquid and drink it warm during an attack of flatulence. Fennel, dill and anise can also be used in this same tea-like method but you need to crush the fennel seeds before seeping, use dill oil instead of dill leaves and limit your use of anise since it may cause an allergic reaction in some individuals. Caraway seeds can also be used crushed to make a tea for excess gas relief or the seeds can be eaten either as is after a meal or in the form of caraway crackers. Aside from tea preparations there are a few other ways that you can use spices to fight flatulence. Basil can be added to many different types of food to add flavour and aid in digestion. Rosemary can be added to gassy foods such as broccoli, cabbage and beans to add flavour and reduce the effects of these foods on the digestive process. Turmeric can be added to rice and enjoyed as a side dish with foods that may cause gas. If eaten with or before the ingestion of gassy foods this spice can stop the occurrence of flatulence before it starts. Coriander, cardamom and clove can also be added to foods during preparation to ease gas pains, reduce gas production and aid in digestion. Coriander works well in stir-fry dishes, cardamom works well in vegetable dishes and cloves make a great addition to rice or fruit dishes. Although flatulence cannot be totally avoided you can get fast relief from the symptoms if you know where to look.